Well thats the issue, its what you want, not what everyone or at least the important ones (TTV) want for now. Until they cut any posability of them to be included in, the inclusion of Kaita should not be written outright, no matter of any current factors we stated in this topic. Its an idea and concept from Bionicle that has a posability of future use, just like any other old concept and idea. They will always change to fit in the new enviroment, no way to go around that. Even with only one frame of reference, it stands with a posability of change of various levels. Also the purist comment was not refering to you specifically. I would have place the quote above the response for easy understanding but using the site from a phone makes it rather difficult to do. Im rather limited here when it comes to quoting. I don't remember whether TTV discussed the Kaita or not on the podcast, but that doesn't change the fact that I don't think it's a very good idea or that I'm not allowed to give reason to why it doesn't work. They should at least adress the idea at some point just like any other idea tht can come up. If they go with it or not is their choice at the end, just like it has always been with this project. I'd definitely would like them to address it and see where each cast member stands in the issue. If they were all for keeping Kaitas (which probably won't happen, I'd imagine it be more half and half, or maybe like the Mask power debate), they'd have to have a pretty dang convincing reason for me to be on board with it. Would probably be the same conclusion as you stated at the end there. There needs to be a good concept for them to place by themselves or someone make for them. 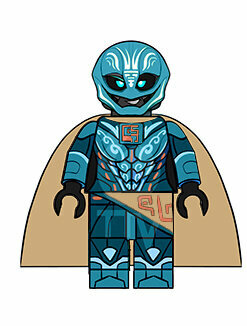 Vezon, a colossi driven mad by Karazhni, uses his mask power to fuse the Toa together. He escapes to continue his scheme, leaving the Toa disoriented in their new transformed states...Later after the Toa have learned to work in harmony (unity), they use their new combined power to defeat Vezon and use his spear to undo the unnatural fusions but not before he finished his task. They could have to encounter Vezon several times before they finally defeat him and each time he could switch up the fusions. In the end though, the Toa would revert back to their natural selves because having the power of two or more Toa in one body at once was destroying them. This is one example of how we could make the Toa Kaita work in the story. Very good. I think I'll take my own swing at a pitch. I think I'll deviate from the just a little bit from the SU formula. During the insane confusion of Brothers' return, the Toa discover a mystical seal around the island containing the chaos, a last line of defense erected by the Gods to prevent the Great Powers from wrecking havoc on the world. In order to pursue Makuta who has circumvented this shield, the Toa must break it. But, breaking it is beyond and normal Toa's power. So, they must learn to "purify" their "divine power," and "pool" this power, to form the Kaita, "the Elemental Gods' champions," who wields the summery of all previous Toa's power and the heroic experience. These forms could not be maintained for very long, so the Toa would still be present in the story, but they could be summoned for a few big, important moments. Can somebody explain why people have such an affinity for the kaita? They were used, once in g1? As a redundant upgrade to get kids to buy all the toa, I really don't understand why people are so intent on shoehorning them into g3. The first is that fusion in general was a rather important ability in G1. Matoran Nui played an important, if obscure, role in 2004, many beloved Dark Hunters were fusions, and Vezon (Bionicle Deadpool himself) was birthed by a sort of "reverse" fusion; these things being sorely overlooked by the main media. The second point is that fusion has been used quite effectively in both Steven Universe and Dragon Ball Super, and people are disappointed that bionicle, which had a form of fusion first, didn't take advantage of it. that's uh... Gewi, Toa of Swamp? fusion in general was a rather important ability in G1. sorely overlooked by the main media. So important it was barely mentioned. fusion has been used quite effectively in both Steven Universe and Dragon Ball Super, and people are disappointed that bionicle, which had a form of fusion first, didn't take advantage of it. First, bionicle didn't invent fusion, who cares if it had it earlier. Second, g1 barely featured fusion, and g2 completely dropped it, it really isn't some pillar of bionicle's identity. you could retell the mata arc and completely remove the kaita, and the only thing you'd need to change is the key to a door. Well, its like how the Toa Nuva's activities during 2007, the events of the Destiny War, and the Battle of Metru Nui were all of vital importance. Very little time was spent on them in the main books, but without them, the whole story could have turned out differently. People who think its a cool power care. Look, I understand that you might not personally like the Kaita. That's fine, they were weird models and mishandled in the story. But, Kaita were the gateway to G1's fusion mechanic, which some fans (including myself) are really attached to. No one is going to pretend that they are a vital part of a G3 story, any more than the Gukko transports are a vital part of G3. Its just a matter of personal taste. The Kaita before were combination models that had story relevance. Now they can be for example fusions of minifigures with story relevance...or any other type of combination model made relevant in the story. That kind of attention makes you actual care for making those combo models since they serve a relevant purpose. It doesnt need to be in a form of a minifigure, it could be a combination of mecha suits or vehicles or something else. The Kaita represent combination models made relevant in the story and that have close tie with the toa and their characters. a system action theme needs action sets after all, can't be just brick built rahi and scenery. I believe someone tried to argue that because Lego Minecraft(a licensed theme of one of the most popular games on the market which is based on structure building) does well with a structure based set lineup, that g3(an action theme which is on its second resurrection and is an original IP) would be successful with a structure focus as well, despite Lego clearly shifting away from structure sets in action themes over the years for presumably financial reasons, ergo they don't sell as well, for example: city is mostly vehicles, you get the occasional scenery piece and usually one structure a year. All this is to make the point that g3 would be dead in the water with a structure focused set lineup, which is why I suggested repurposing the kaita title for vehicles. I realise this post was a touch wordy, but I wanted to reiterate that point: that people need to look at g3 as a realistically successful action theme, and not a line of set pieces, regardless of how many gimmicks you say you would cram into the b.u.r.p.'s. Kaita as Guardian Colossus of the Land. Created by past Toa as a defense mechanism if they ever were needed additional assistence in protecting the lands or if the specific Toa was dead and they needed to protect the land until another Toa came to be (merging what the Exo Toa story and concept here as well). Each Element had its own Guardian Kaita Colossus (Brutaka for Stone and can transform into a scorpion inspired by Ketar, Axon for Ice and can transform into a rhino inspired by Melum, Maxilos for Fire and can tranform into a phoenix inspired by Ikir, Keetongu for Earth can transform into mole inspired by Terak, Hidraxon for Water can transform into a shark inspired by Akida, and Jetrax for Air can transform into a dragonfly inspired by Uxar). Combination of all of them would create the Great Kaita Colosuss called Ignika that resembles Mata Nui and it can transform into a Dragon of similar appearance as the Green Ninja Mech Dragon but with three pairs massive wings. This is an interesting idea but transforming animal robots might be to similar to Transformers/Power Rangers/Voltron and could hypothetically get Lego sued. I believe this is why Lego has only really done vehicle to vehicle transformations. At the very least it would be walking a very fine line. Additionally (correct me if I'm wrong), I don't think the elemental gods are represented by the animals of g2 in g3. That said, we can still have mechs and animal like vehicles as there own thing that can combine kind of like g2's uniters. The Elemental Gods have their standard spirit forms, but can also interact with the Matoran by taking the form of the G2 Creatures. This was mentioned in a past episode of the podcast. Using those characters as Kaita is an interesting idea, though I don't see it coming into play until after the first 3 years (this goes for any Kaita concept). I agree that Kaita can find a place in G3, but not enough to see them any sooner that year 4. The first 2 years are already planned out for story, and Kaita would only complicate things. Year 3 has less details, but I don't see it as a good spot to introduce them. Toa upgrades will likely happen at the end of year 3 or during year 4, so I could see Kaita being introduced some time after that. could hypothetically get Lego sued. The fact you list 3 examples of the concept pretty much explains through its existence why that wouldn't happen. Perhaps dropping the humanoid forms would be for the best, and have the colossus be animalistic machines, it would ultimately result in a better set, we all know what most transforming Lego sets look like, gappy and stiff, I would suggest perhaps being able to separate the colossi into chunks and mixing and combining the parts, ultimately forming either two kaita or a larger singular kaita nui. I suggested they be powered by elemental energy, both as a way to balance the power boost, but also it could explain why they were lost to the tribes, as they were unnecessary and unwieldy given the matoran's limited elemental ability. Either way, I'm in agreement that the kaita and exo-toa should be merged.